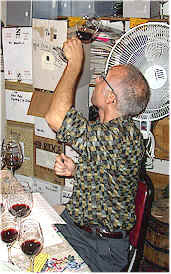 The 1999 growing season in Washington state was quite cool early on, causing many wise vintners to do a fair bit of crop thinning in hopes of ripening the remaining fruit. Spring and summer seasons were cool and so wiser growers decided leaving a full crop in the vineyard was risky. The late summer and early fall saw an increase in temperatures, allowing for full maturation of the fruit. The long "hang time" is credited with producing more flavorful fruit. Good growers were able to harvest very good fruit in this vintage. We assembled a set of wines from top estates and some of the "new kids on the block" to see if we could make any new discoveries. The "old-timers" did very well, while some of the newer "kids" seem to have a ways to go. 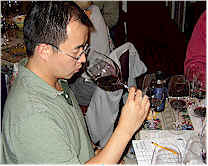 8th Place: ANDREW WILL "Klipsun"
This small producer seems to always get high marks from various wine journals, but this bottling finished in a last place tie. One taster found "vanillin notes on the nose, with lean structure, some wild berry fruit and a twang of earthiness, along with a light, meaty finish." Someone else described it as "pleasant, with lots of strawberry jam notes." Another taster found "licorice aromas and a tart, citric flavor." A couple of tasters felt this wine blossomed with aeration, one finding "chewy flavors," while the other found "star anise and guava, but it's a bit sour." One person described this as having a "loganberry character," while another felt the wine was "more reminiscent of a Zinfandel." I found the primary fragrances to show the character of jam or preserved, cooked fruits. Underneath that, I encountered hints of licorice or anise. The overall impression is of a ripe wine that's rather "flat" on the palate and has little to do with great Cabernet, but more similar to warm-climate "vin de table." Disappointing, to say the least. 7th Place: HIGHTOWER "Columbia Valley"
One taster felt this was "seriously oxidized." Another found "sweet, yellow fruits such as guava and papaya notes...it's not bad!" But someone else said "This is a bad wine, showing herbal notes and modest, earthy fruit, light bodied and it's got a very watery and astringent finish." Another participant was more forgiving, saying "this needs time." I found a curious, sweet aroma reminding me of cherry or raspberry candy. I found a note of sage leaves after a while. It's more a red fruit sort of wine with a nice finish. I'd be hard-pressed to identify it as Cabernet Sauvignon, though. 6th Place: BETZ FAMILY WINE "Pre de Famille"
"This wine seemed to improve during the tasting, almost 'putting on weight'." said one critic, who also found it to have a note of "vanilla and cassis." Another person "liked the aromatics," which another taster described as "burnt and anise-like." Someone else said "This wine could have been made by a certain, famous winery in Cupertino, California, as it has lots of Brettanomyces...and yet it's my first place wine." Another fellow found a "silky texture, tart, wild blueberry notes...smoke and cedar with ripened plum notes...." Another gentleman found the "Brettanomyces and iodine aromas with great structure." My first impressions were of cassis and definite Cabernet notes with a lightly herbal quality. As it sat in the glass the leathery notes of Brettanomyces became more apparent. It's a reasonably elegant example of Cabernet Sauvignon, with the oak playing a supporting role. You might consider holding this for 3-6 years. One star (three star scale, no stars being "standard" or ordinary). 5th Place: L'ECOLE No. 41 "Walla Walla Valley"
One taster described this as having a "grapefruit flavor which is unpleasant." Another taster felt this shows "a softness across the palate and it's rich and really excellent!" A couple of people found a sharp note of SO2, one saying this has a "chalky and bitter finish." Another person found is to be a "shallow and simple red wine." Someone else found "dense, smoky notes with wild berry and currant fruit with mildly oaky notes and a hint of herbaceousness. Another panel member felt it was "low in acidity, yet has a stemmy, chalky, sort of 'green,' bitter finish." I found the fragrances to be of cassis and decidedly "Cabernet," with a light touch of wood in the background. The aromas, with time, displayed a hint of coffee grounds. Though the wine has a moderate amount of tannin, there's plenty of fruit to assure five to ten years of cellaring. One-and-a-half stars. 4th Place: QUILCEDA CREEK "Washington"
"Deep, powerful, Venezuelan dark chocolate notes, layered with ripe plum-laced currant fruit and a rich, vanilla spice finish." said one precise taster. Another found it "Sharp, hot, bitter, tannic and totally out of sync...otherwise, I loved it!" A third person pegged it as "A great wine," while someone else found notes of "milk chocolate." One person found a "sweet 'attack,' but it fell off at the end." Less positively, this was described as having notes of "tar, rubber and mercaptan, with a tannic finish." Another fellow found it to have a "sweet edge, with a really tannic wallop...totally out of whack." I was impressed by its dark fruit notes, finding ripe plum and berry notes with a mildly cedary bouquet. Quite complex and pleasing on the nose. The same elements come through on the palate, though there's no denying the wine does have a fair bit of astringency and tannins (hey, it IS Cabernet, after all!). I felt the layers of fruit on the palate will maintain nicely as the tannins resolve over the next 5, 10 or 15 years. Two stars+. 3rd Place: CHATEAU STE. 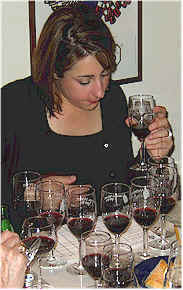 MICHELLE "Columbia Valley"
One taster found an "off" note to the nose and said this was "unacceptable." Another found "black raspberry with oak and roasted notes, but very weak in the middle." Someone else found this was :lacking complexity, with tart, cherry fruit nuances and some milk chocolate notes. It also has a rather thin finish." 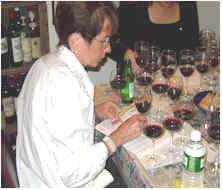 One participant found "a nice nose, with hints of vanilla and blackberry." Someone else said it had "the best balance, with a nice cherry finish and it's not overly tannic." Another person described this as being "more reminiscent of Merlot than Cabernet Sauvignon." I found lots of red currant fruit aromas, some berry notes and a light touch of wood to the nose. I felt it's got a bit more aggressive tannins than it needs given the depth of fruit on the palate. Overall, it's a perfectly pleasant, but not terribly profound wine. One star. 2nd Place: WOODWARD CANYON "Columbia Valley"
A couple of tasters detected an off note here, one saying "I was bothered by it's corky or musty notes. These made it difficult to taste." Ellen ranked it last, saying she found it to be slightly musty. Another person found "Oaky, vanilla notes, with dark berry fruit...very nice." Someone else found this to have "long-term cellaring potential, with charred oak notes." Another taster said it had "the most oak on the finish." One panel member found "distinctive gobs of dark chocolate, vanilla spice and a sweet leather note." 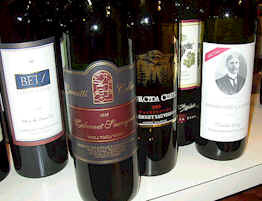 I found lots of red fruit aromas, the wine showing good Cabernet fruit with some nice oak framing it. The nose seemed to improve over the course of the tasting, too. It became even more impressive on the palate, showing plenty of structure to assure a decade (or more) of cellaring potential. Big, deep, rich and exceptional. Two stars+. 1st Place: LEONETTI CELLAR "Walla Walla"
One taster described the fragrance as "having lots of citrus peel notes." Another person found "very ripe, minty oak and dusty kumquat notes." Someone else said "this softened with time." A fourth person found "coffee and blackberry fruit." Another panel member found "vanilla beans and unsweetened chocolate, with a coffee and tobacco finish." Someone else found this to be "big, fruity, massive, with a touch of caramel, plums and chocolate." 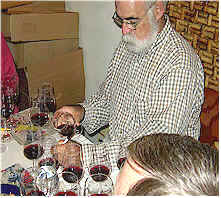 A final participant said it's "oaky, silky and a dead-bang winner of a Cabernet!" I was really enchanted by the nose of this wine, as with most Leonetti wines I've had the good fortune to taste. Here's a moderately tannic Cabernet with a sweet personality, showing vanillin and cedar notes on the palate. It's a very showy wine, capable of cellaring another 5-10 years, though drinking it now (with food) would certainly be enjoyable! Two stars+.